It’s funny what sticks in your head as the days tumble on. Food punctuates my memories. Tabouleh, baba ganoush, spinach pie, lamb a couple ways, trumpet mushrooms, bachelor steak, banana cake, mac’n’cheese…are a few of the cooked meals conjured up this week. Home cooking and eating is what we do. Flat roast chicken, broccoli and rice pilaf was prepared for the family on Friday afternoon. 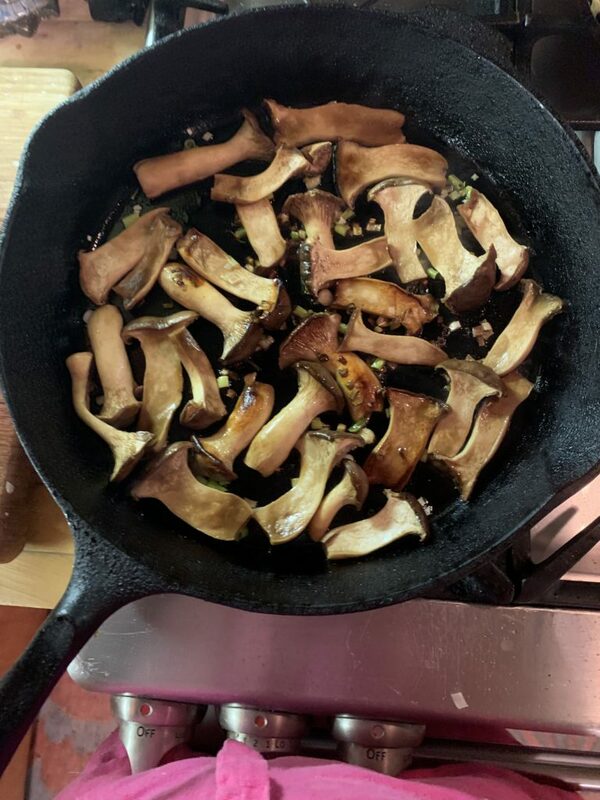 Then I left home for a dinner date with two of my boys in Williamsburg, Brooklyn at a cramped, uncomfortable, dark, restaurant serving thimble-sized cocktails; I lamented leaving that flat roast chicken at home. Biting into the chicken of the restaurant was a bitter taste of my own medicine. I made the choice. I held my tongue saddened by the disappointing waste of it all. A couple days later, one son expressed outrage at the price, the bummer, and the disappointment of the meal. Wow, he noticed?? Yes! The flat roast chicken dinner at home cost about 5% of the price we paid at that packed restaurant. I wanted to go. I wanted to love it. But squaring the taste, cost, comfort and deliciousness rubric of Restaurant Friday Night is absolutely impossible to do. Cooking at home is no second fiddle to a dining date at a cool restaurant! Between work and family—Saturday, Sunday, Monday, and Tuesday—we ate into our remaining groceries. Yesterday morning the groceries ran out, the need for cooked food was real, and the pantry pulled through again. 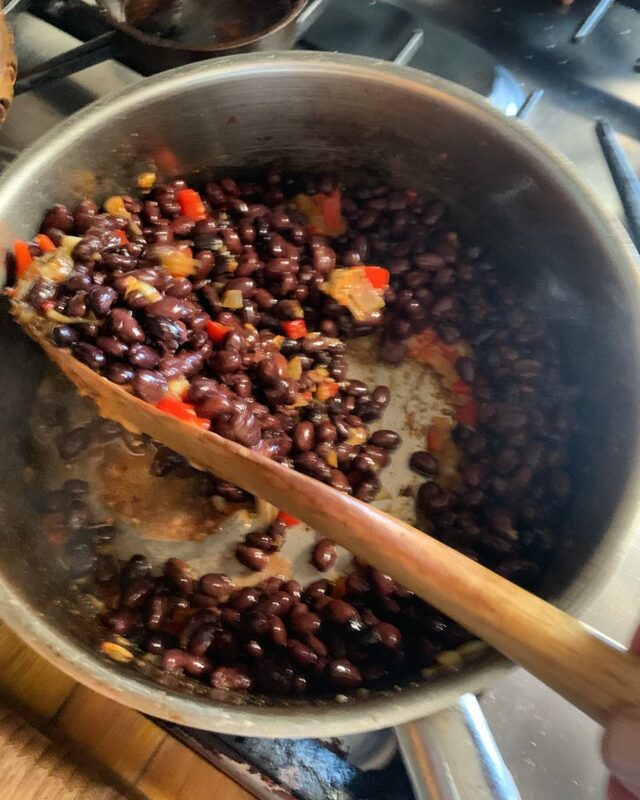 Cans of beans, rice, spices, onions, garlic, and a few fresh scraps in the fridge meant a meal could be made for under $5.00 (recipe link here). Topped with hot sauce, a savory bean mountain, spooned over a fluffy rice pillow, eaten at home at 5% of the Williamsburg dinner had me wondering. Why? Why if you’re young, struggling to pay the bills, aren’t you cooking at home and inviting anyone over who wants to eat? The 5% home cantina is always an awesome dining choice. It’s one to be proud of. I still eat out weekly by choice and necessity, but I always seek to learn something new, find the real cooks, and never ever waste a meal. Preheat oven to 425 degrees. Using kitchen shears, cut along both sides of the backbone to remove; discard or reserve for broth, if desired. Open the chicken’s legs and spread the bird down flat, skin side up. Press down firmly on the breastbone to flatten. Pat dry with paper towels; season generously with salt and pepper. 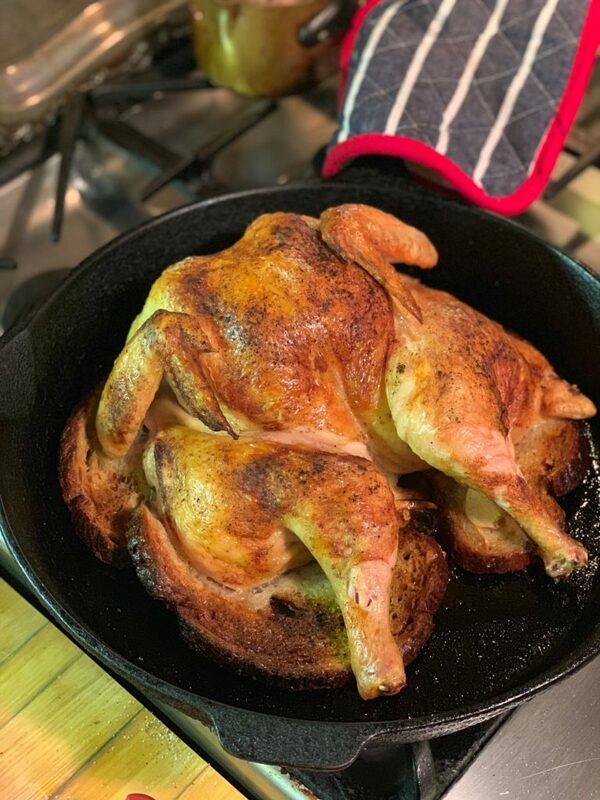 Roast chicken until golden brown and cooked through or until an instant-read thermometer inserted into the thickest part reaches 165 degrees, about 40 minutes. Transfer chicken to a cutting board and let stand 10 minutes.